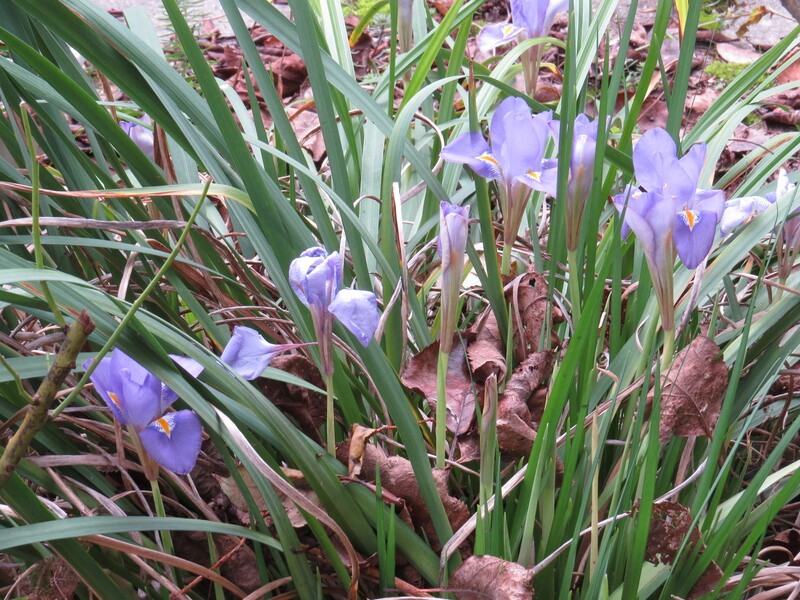 Dear Readers, I have always loved irises, but have never been able to grow them. This surprises me somewhat, as the big yellow flag irises that grow in the wild, damp places of the UK would seem to be perfectly adapted to taking over my pond, but they refuse to do anything other than wither and die. Similarly, whenever, against my better judgement, I buy a bunch of irises for a vase, they turn papery and grey without ever opening. So I was pleased to see these little chaps in full flower in Fortis Green, just round the corner from my house. Their delicate lilac-blue flowers with their custard-coloured tongues were almost shocking against the dead leaves. 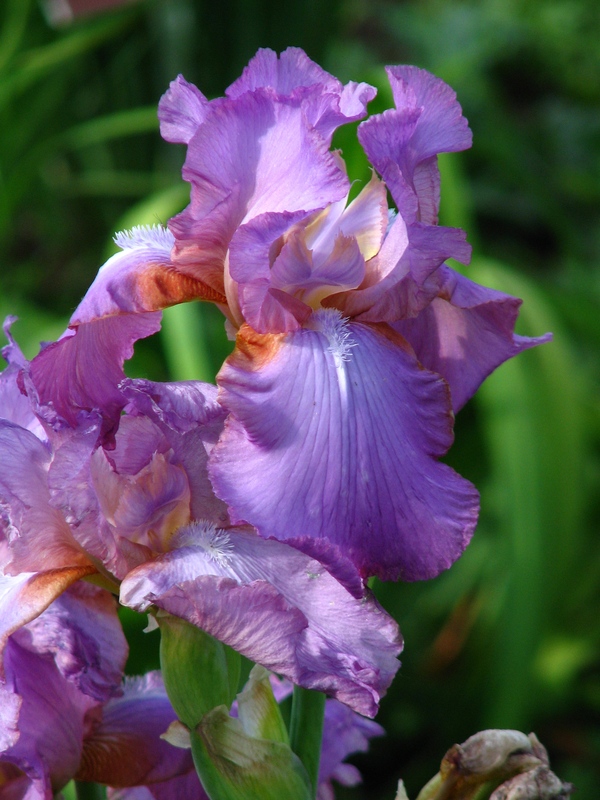 Irises are a big, diverse group of plants, and are named for Iris, the goddess of the rainbow. 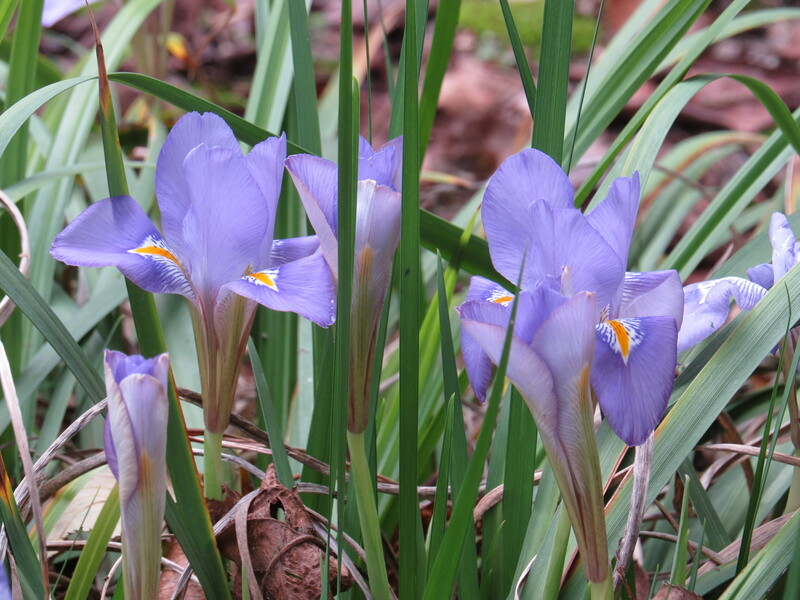 Iris is said to have been a messenger of the gods, and crops up regularly in The Iliad. 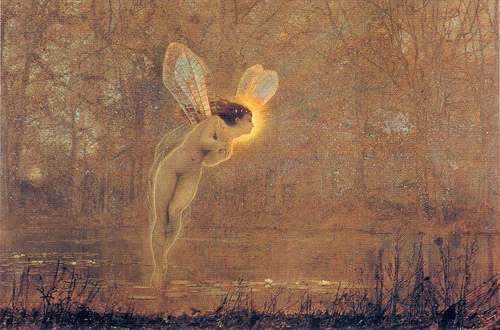 Like the rainbow, she is said to have linked heaven and earth and would often help intercede on behalf of humans, bringing their prayers to the attention of the gods. 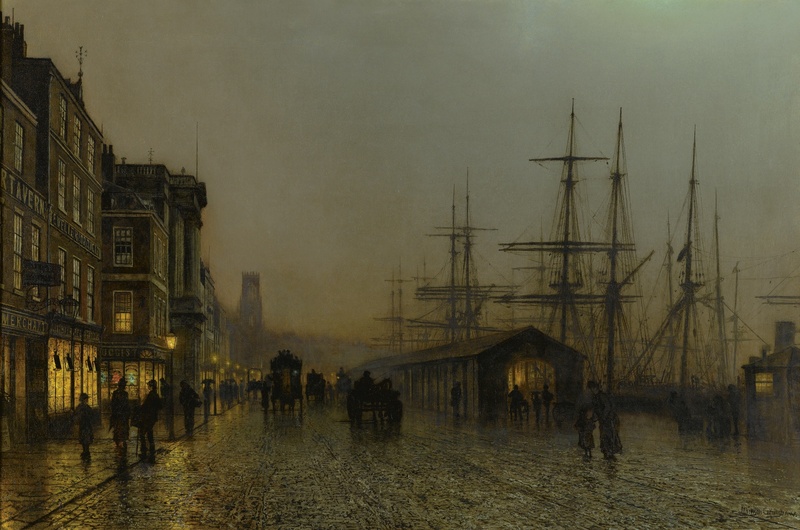 A minor digression here – I have always been very fond of the paintings of John Atkinson Grimshaw – I know that they are deeply unfashionable these days, but I love his depictions of the wet streets of Victorian cities. They are so atmospheric that they seem to beg for a story of dubious goings on at the waterfront, or of ladies shopping before Christmas. See what you think. But, back to the iris. The ‘design’ of the flower is an example of a plant that, in its natural state, has co-evolved with the insects that pollinate it. Three of the petals seem to ‘clap hands’ in the centre of the flower (the ‘standards’), with the other three petals curling down like lolling tongues (the ‘falls’). The lower petals form a landing stage for insects, and the shape of the sexual organs means that after pollen is deposited on the back of a bee, it can only be transferred to another flower, rather than pollinating the same one. 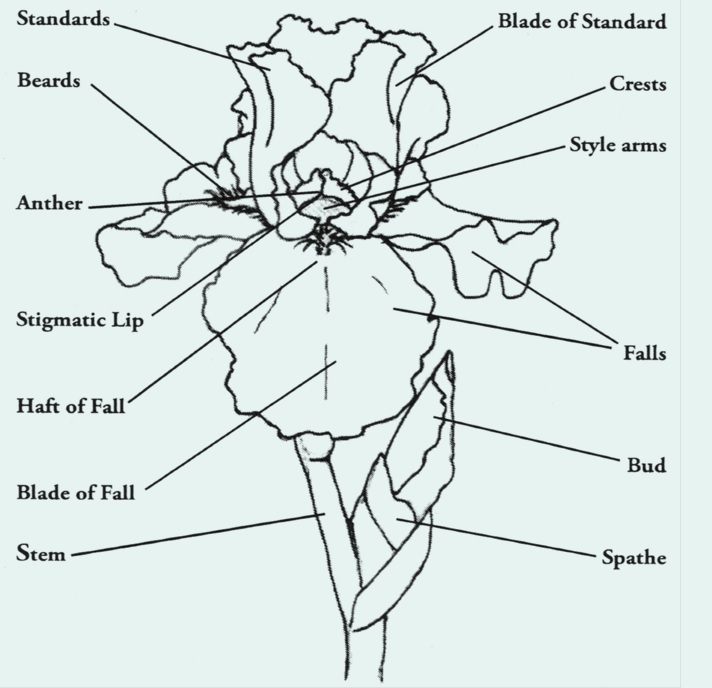 Of course, the appearance of the flower has been mightily changed by horticulturalists over the years, but this basic structure largely remains, regardless of the colour or size of the bloom. Maybe this is where I’m going wrong with my irises. The flowers of this iris have been used to produce yellow cloth by the Tartar people of Western Siberia, and there is lots of information on the Interwebs for those who want to use iris flowers as dye. Medieval illuminators used a colour called iris green, and during my research I have discovered the website ‘Threadborne’ by Wendy Feldberg. She has several posts on using irises of various kinds as dye and as ink, which I found absolutely fascinating. You can have a look here. The root of the plant is said to be good for coughs, and it is also said that the Chinese made an edible starch from it. ‘The Mysteries of Human Reproduction‘ by Dr. Raymond Bernard mentions that Siberian brides eat the cooked fruit of the Siberian iris before their wedding night to increase fertility. This is probably an improvement over the poor brides of Kamchatka, who apparently eat spiders to create the same effect. Sadly, the rhizome is also apparently poisonous, and handling it can cause dermatitis. As always, caution is advised. 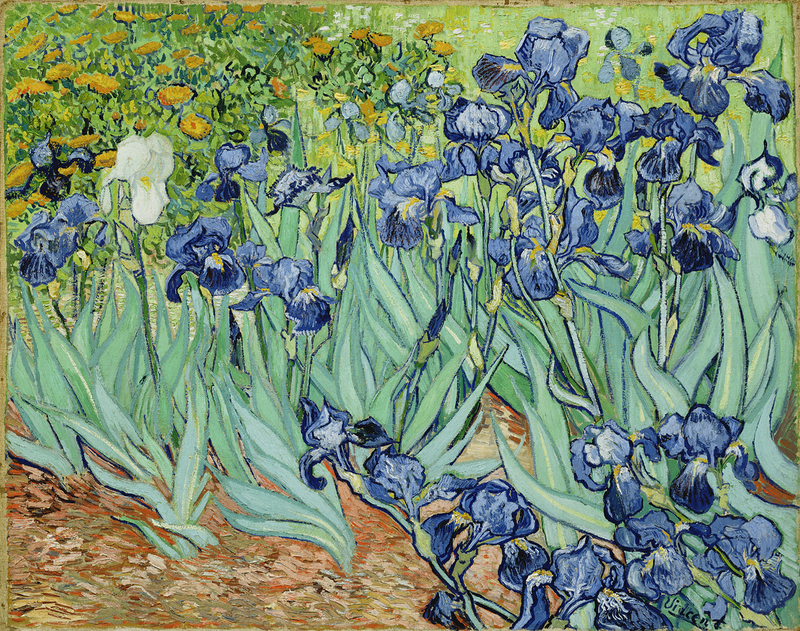 As you might expect, such a splendid plant has inspired many artists, not the least of which, Vincent Van Gogh, is another of my favourites. The painting below shows bearded irises rather than Siberian ones, but hey. I love the way that my eye is drawn to the single white iris on the left, plus that sunny spread of marigolds in the corner. That such a joyful, sun-filled picture could be created by someone who struggled so hard with depression fills me with a kind of hope. And here is a puzzle. As you know, I do like a bit of poetry, so here is ‘Iris’ by William Carlos Williams. ‘ sweet, soft, powdery, suede-like – rather like violets, which we tend to be more familiar with as a scent‘. 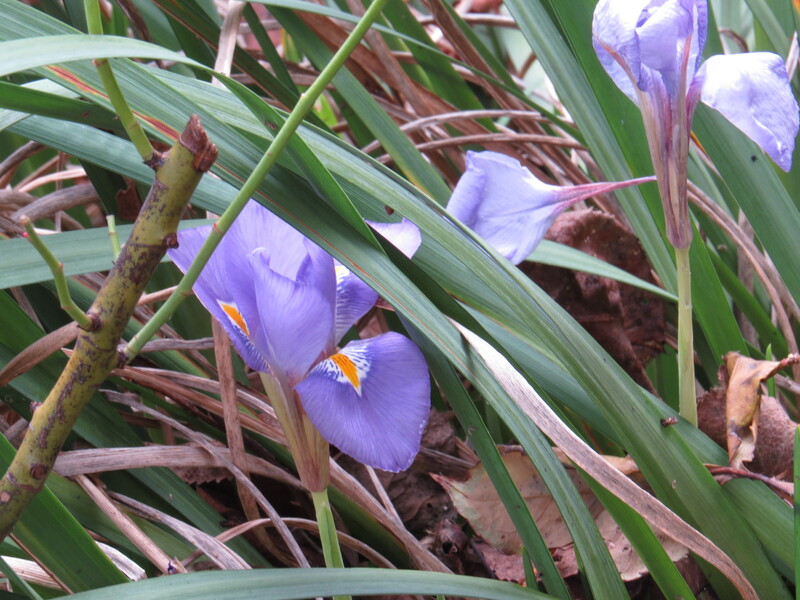 However, I have never come across an iris flower that had a scent. Is it just because mine tend to die as soon as bring them home, as if struck by a ray gun? Or am I missing something? Or is the poet delusional? This was, after all, the man who ate all the plums in the fridge without so much as a by-your-leave, so he might not be completely reliable. I do hope someone can enlighten me….. This entry was posted in London Plants on January 16, 2019 by Bug Woman. So many of the iris are too easy to grow. It surprises me too that you could not grow some sort of iris. I mean, if one type does not do well, there should be another type that does do well. I would not expect our native iris that are adapted to chaparral to do well there, but there are so many others that should be pleased with your climate. Tony, I have slapped myself on the wrist, am going to do some research and try again….watch this space! I don’t think that iris of any kind are a ‘requirement’. If none of them grow there, there are plenty of things that will grow there. 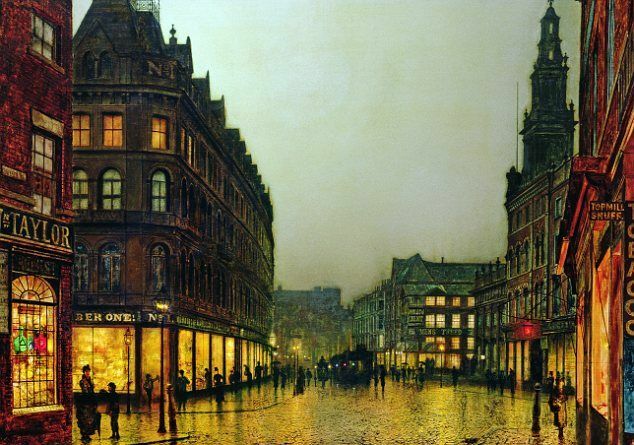 I’m fond of Grimshaw too. I sometimes think that his name works against him, it sounds (to me, at any rate) Victorian and dour. Agreed. You’d half expecting him to be painting dark satanic mills rather than these light-filled delights…. I love those paintings, the light, particularly on the 3rd one, is amazing. 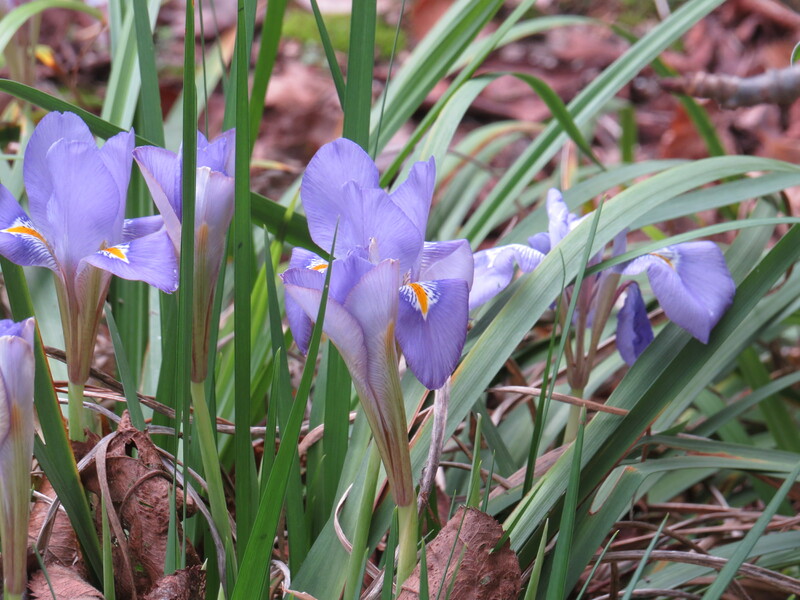 My Irises are beautifully perfumed and I look forward to each May to savour their deliciousness. They are grown from rhizomes which do not need much goodness in the soil to thrive. I replant every few years because they grow too closely and stop themselves from blooming. Take the rhizome, place the roots on the earth and cover them. Leave the rhizomes out of the earth, water the roots and allow to bake in the sun. Result – beautiful blooms! Here is a link for you: https://www.bearded-iris.co.uk/Fragrant-Irises.html. Hermes has a perfume called Hiris. Not cheap as you would imagine, but pleasant and possibly ‘suede like’. Hi Karen, thanks for this! I too have given up buying irises from the florist, but I shall definitely have a look for ‘Jane Philips’, I have obviously been missing ou!